Nutritional supplementation is an integral part of therapeutic management in critically ill patients. The challenges increased manifold if these patients are admitted with co-morbidities, trauma or any other complication. Management of critically ill burn patients is extremely challenging to the attending intensivist. The gross pathophysiological changes, altered fluid dynamics, vulnerability to infections, metabolic derangements, electrolyte disturbances and severity of burns influence largely the nutritional parameters and therapeutic interventions. Ever since the evolution of critical care services, attempts have been continuously made by the researchers to improve and optimize the nutritional status in critically ill-patients. The evolving guidelines and protocols of nutritional therapy in critically sick patients can be extrapolated to burn patients also in Intensive Care Unit (ICU), which has largely been supported by the emergence of evidence-based medicine. The current manuscript is aimed at discussing important issues pertaining to the nutritional supplementation of patients admitted with varying degree of burns to the ICU. The present manuscript is an attempt to highlight the understanding of the nutritional aspects in patient with burns. The measures adopted included extensive scrutiny of literary evidence from internet resources, journals and textbooks of surgery, nutrition, anesthesiology and intensive care. The strategies included exploration of full-text articles and abstracts from various search engines such as PubMed, Medscape, Scopus, Science Direct, Medline, Yahoo, Google Scholar and many others, which included keywords such as enteral nutrition, burns, intensive care, critically ill-patients. At present, various guidelines set up by European Society for Clinical Nutrition and Metabolism are typically followed in the ICU. ALLIANCE is one of the international organizations, which is working at international as well as at Indian level to set up the nutritional goals. Scope of enteral nutrition has improved with the endoscopic placement of jejunostomy and gastrostomy feeding tubes. Development of various new bio-markers of illness can also be of great help in guiding the nutritional goals. Research in the field of pharmaco-genomics has also linked the role of nutrition in gene expression. Nutrition plan of the burn patients should include site, type and percentage of burns, age of the patient and any other preexisting medical disorders. These factors are important as patients having burns more than 10% of TBSA along with burns of the face, genitalia, etc., need special care. Children with burns more than 10% of TBSA and patients with inhalational or electrical burns need to be managed very carefully. Preexisting medical disorders can enhance the mortality. Energy requirement in the acute phase can be calculated from resting energy expenditures (REE). However, increase is variable over time and mainly takes TBSA into consideration. The concept of hyperalimentation was followed earlier, but REE increase is seen during the 1st week, and it decreases thereafter. It has also been seen that if the feed is given according to 25–30 kcal/kg/day, chances of under feeding are more., Overfeeding also increases morbidity. The aim of nutritional support should be to maintain the lean body mass as hypermetabolic state results in catabolism in severe burns. Indirect calorimetry is now considered as the gold standard to calculate energy requirements in burn patients. Measurements are made in the fed state, and the results of the analysis are rounded to the upper 100 value, without exceeding + 10% of the measured value. Carbohydrates form the major source of energy as these provide glucose for metabolic pathways, spare amino acids and also serve as fuel for wound healing but should not be more than 60% of total energy intake and should not be more than 5 mg/kg/min that is, 7 g/kg/day. Fat should not be more than 30–35% of nonprotein calories because the hypermetabolic response in these patients suppresses lipolysis and limit their breakdown to be used as source of energy. Use of low-fat diet is advisable in severe burns. Use of omega-3 fatty acids has been seen to be associated with improved outcome as compared to the use of omega-6 fatty acids as metabolism of the former is associated without invoking any inflammatory response., Protein catabolism is also common in burn patients, which can decrease lean body mass and patients get more prone to infections. Burn patients need 1.5–2 g/kg/day of the proteins in feed. Males = (66.5) + (13.7 × W) + (5 × H) − (6.8 × A). Females = (655.1) + (9.6 × W) + (1.8 × H) − (4.7 × A). Above mentioned formula is for healthy, febrile individuals. In patients with burns more than 30%, RME increases by 100%. Carbohydrates should provide 30–70% of total calories needed. Fats should provide 20–50% and proteins approximately 15–20% of total energy requirement. REE (Kcal) = −4343+ (10.5 × TBSA burned) + (0.23 × Kcal) + (0.84 × Harris Benedict) + (114 × T°C) − (4.5 × days postburn). Kcals = calories intake in past 24 h.
Harris Benedict = basal requirement in calories using the Harris Benedict equation with no stress factors or activity factors. T = body temperature in degrees celsius. Days postburn = the number of days after the burn injury is sustained using the day itself as day zero. Glutamine acts as a main energy source for enterocytes and lymphocytes. It is one of the important transport amino acid. It performs various functions asit acts as a source of energy for hepatocytes, maintains integrity, permeability and immune function of small intestine and improves wound healing., The dose of glutamine supplementation is around 0.3 g/kg/day. It has also been seen in previous several studies that immunonutrition rich in nucleotides and (omega)-3 fish oil decreases the mortality rate along with decrease in recurrence rate of bacteraemia in sick patients in intensive care. Burn patients need sedation and analgesia very frequently, so these are at increased risk of constipation. Thus, their diet should be rich in fibers. Early enteral feed via gastric route is preferred in these patients as it is associated with attenuation of the stress response, stress-induced ulcers and increased production of immunoglobulins. Few factors can prevent early start of enteral feeding as in the initial phase of resuscitation, larger amounts of crystalloids used, can lead to edema of the intestine and paralytic ileus. Enhanced capillary leak in the early phase of burns increases the fluid requirement. Micronutrient supplementation reduces the mortality and morbidity in critically ill patients as their deficiency results in lowered host defenses and impaired production of antioxidants. Also, the intravenous route is best for their supplementation. Duration, dose and timing of giving these micronutrients are the important considerations for improving their utility. Thus the addition of copper, zinc, selenium, Vitamin B1, C, D, E to feed is of great helpful. Copper, zinc and selenium are lost in larger amounts in burn patients in the exudate. Their supplementation decreases fat breakdown, improved wound healing, and thus shorter hospital stay. Thiamine replacement improves lactate and pyruvate metabolism. Vitamin C and E supplementation enhance wound healing. Their dose should be 1.5–3 times higher than recommended daily intake. Loss of Vitamin D is also needed to prevent bone loss. Increased oxidative stress in burn patients is associated with enhanced depletion of micronutrients. Several other measures like warm ambient temperature (28–30° centigrade), nonselective beta blockers (propranolol) and oxandrolone are also important measures, which prevent hypermetabolism and hyper catabolism in burn patients. Beta blockers, by reducing heart rate by 20% attenuate stress hormone release. Propranolol can be started at the end of the 1st week of burns., Oxandrolone in a dose of 10 mg/12 h decrease mortality and thus hospital stay in burn patients., There is no role of arginine supplementation according to the recent review. Ornithine alpha-ketoglutarate is precursor and thus an alternative to glutamine, it’s use during acute phase after burns improves nitrogen balance. Target glucose levels between 5 and 8 mmol/L has been seen to be associated with several clinical benefits such as better graft uptake, lesser infectious complications and ultimately decreased mortality. 100–150 mg/dl is a standard target, which is otherwise maintained in other critical patients in ICU., Exenatide, a new incretin, which inhibits glucagon secretion can decrease external insulin requirement in pediatric burn patients. Adequate pain control and physiotherapy are also essential in early rehabilitation of these patients. Major reason for preference of enteral nutrition over parenteral nutrition is decrease in morbidity with the use of enteral nutrition due to reduction in the incidence of central venous line-related infections, pneumonia and abdominal abscess in trauma patients. In several studies, benefits in the form of a decrease in hospital stay, cost of nutrition and regain of the cognitive function in head injury patients has been seen with enteral nutrition., Five of the various six meta-analysis done in the literature has shown no difference in the mortality between enteral and parenteral form of nutritional therapies., In a study done by Simpson and Doig, despite the higher incidence of infectious complications with use of parenteral nutrition, significantly lower mortality has been seen as compared to enteral nutrition. Enteral feeding should be started early within first 24–48 h after admission, once fluid resuscitation is complete and patient is hemodynamically stable. Feed should be advanced towards desired target within next 48–72 h. In a study by Marik and Zaloga, a significant reduction in infectious morbidity and hospital stay has been seen with early enteral nutrition when compared to delayed start. If patients are on high dose of inotropes or vasopressors and need excessive volumes of fluids for resuscitation, due to chances of sub-clinical ischemia or reperfusion injury to the gut, enteral nutrition should be withheld. As bowel sounds are indicative of contractile movements and it is not necessary that these indicate integrity of bowel mucosa, absorptive capacity and barrier function. 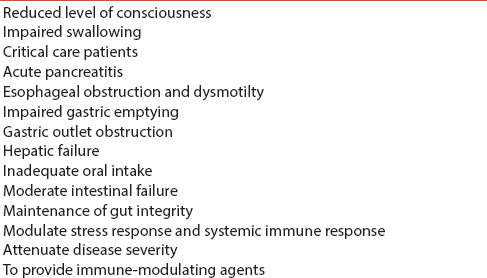 Main reasons for intestinal dysfunction in critically ill patients are mucosal barrier dysfunction, mucosal atrophy, reduced gut-associated lymphoid tissue and dysmotilty. [50,51] Hence in critical patients, neither the presence or absence of bowel sounds and passage of stools is mandatory for initiating enteral feed. And also if sick patients show intolerance to gastric feeding, are at high risk of aspiration and have high residual volume, can be started on small bowel feed. There is also an evidence that if early enteral nutrition has not been started within 7 days, parenteral nutrition can be started. As permeability if intestine increases during 1st week of severe burns, there is need to provide > 50–65% of the desired target. During first 7–10 days, parenteral nutrition supplementation has not been found out to be helpful. Braunschweig et al. and Sandström et al. have also concluded from their study that after first 7–10 days, requirement for proteins and energy are increased in order to prevent complications due to poor nutritional status. Thus, if we are unable to meet the energy requirement of the sick patient by 100% of the target level needed, parenteral nutrition can be supplemented., Studies in the literature have also shown that those patients who receive larger volume of enteral nutrition, encounter less complications and thus less associated morbidity than patients receiving lower feed amount., There are various indications of enteral nutrition as listed in [Table 1]. Obese patients are at higher risk of infections, deep vein thrombosis, insulin resistance, etc., So protein supplementation in a dose of 2–2.5 g/kg of ideal body weight/day and 60–70% of caloric requirement enhance neutral nitrogen balance and promote wound healing. To prevent problems associated with ileus and inadequate nutrient delivery, time for fasting before or after any procedure should be kept minimum possible. Various tests are needed in patients receiving total parenteral nutrition in the form of total blood count, B12 and folate levels, serum magnesium, phosphate, calcium, glucose, liver function tests, serum albumin, prealbumin, C-reactive protein zinc and copper levels. Investigations to be done in patients on total parenteral nutrition have been mentioned in [Table 2], as written below. Frequency of tests can be reduced once the patient is stable. Complete attention should be given to peripheral lines for signs of thrombophlebitis and centrally sited lines for signs of infection or inflammatory changes. It has also been studied in the literature that normal functioning of many endocrine organs like thyroid, pancreas etc., is also linked to the nutritional status. Thus nutritional imbalance can hamper their normal functioning. Various endocrine disorders such as obesity, thyroid disorders and diabetes have been linked with dietary modifications. Increased prevalence of endocrine disorders have been seen with over nutrition. Dietary patterns actually programme the different mechanisms associated with these disorders. As in case of diabetes mellitus, presence of transcription factor TCF7L2 has been linked, which can be regulated by fat and glucose rich diet. All the dietary components affect endocrine system of body. Dietary modifications both improve symptomatology as well as progression of kidney diseases. Many factors like type and severity of renal disease, nutritional status, dry weight, dietary intake, co-morbid diseases, physical activity, biochemical markers and also the adjusted body weight help in calculation of energy requirement of these patients. Lesser funds are available for health services. Our own guidelines and recommendations should be made according to the Indian scenario after extensive research and studies. These guidelines need to be followed strictly in ICU as per the institutional resources. Training programmes should be conducted for training of the staff. Limitations of current review article may include but are not limited to lesser number of randomized controlled trials, paucity of universal guidelines, different beliefs and cultural practices in our country, different food fads, socio-religious factors etc., which can have either direct or indirect effect on the nutritional aspects in burn patients. Bajwa SS. Nutritional facts in critically ill patients: The past, present and the future. J Med Nutr Nutraceuticals 2014;3:6-10. Atiyeh BS, Gunn SW, Dibo SA. Metabolic implications of severe burn injuries and their management: A systematic review of the literature. World J Surg 2008;32:1857-69. Gauglitz GG. Hypermetabolic response to severe burn injury: Recognition and treatment. Crit Care Clin 2001;17:107. Pereira CT, Herndon DN. The pharmacologic modulation of the hypermetabolic response to burns. Adv Surg 2005;39:245-61. Herndon DN, Tompkins RG. Support of the metabolic response to burn injury. Lancet 2004;363:1895-902. Williams FN, Branski LK, Jeschke MG, Herndon DN. What, how, and how much should patients with burns be fed? Surg Clin North Am 2011;91:609-29. Mochizuki H, Trocki O, Domimioni L, Brackett KA, Joffe SN, Alexander JW. Mechanism of prevention of post burn hyper metabolism and catabolism by early enteral feeding. Ann Surg 1984;200:297-310. Tinckler LF. Surgery and Intestinal motility. Br J Surg 1965;52:140-50. Moss G. Maintenance of gastrointestinal function after bowel surgery and immediate enteral full nutrition. II. Clinical experience, with objective demonstration of intestinal absorption and motility. JPEN J Parenter Enteral Nutr 1981;5:215-20. Clinical Practice Guidelines Nutrition Burn Patient Management NSW Statewide Burn Injury Service. Version 3; 2011. Available from: http://www.aci.health.nsw.gov.au/__data/assets/pdf_file/0009/162639/SBIS_Nutrition_CPG_new_format.pdf. [Last cited on 2015 Mar 21]. Cunningham JJ. Factors contributing to increased energy expenditure in thermal injury: A review of studies employing indirect calorimetry. JPEN J Parenter Enteral Nutr 1990;14:649-56. Rimdeika R, Gudaviciene D, Adamonis K, Barauskas G, Pavalkis D, Endzinas Z. The effectiveness of caloric value of enteral nutrition in patients with major burns. Burns 2006;32:83-6. Rousseau AF, Losser MR, Ichai C, Berger MM. ESPEN endorsed recommendations: Nutritional therapy in major burns. Clin Nutr 2013;32:497-502. Demling RH, Seigne P. Metabolic management of patients with severe burns. World J Surg 2000;24:673-80. Alexander JW, Saito H, Trocki O, Ogle CK. The importance of lipid type in the diet after burn injury. Ann Surg 1986;204:1-8. Huschak G, Zur Nieden K, Hoell T, Riemann D, Mast H, Stuttmann R. Olive oil based nutrition in multiple trauma patients: A pilot study. Intensive Care Med 2005;31:1202-8. Saffle JR, Graves C. Nutritional support of the burned patient. In: Herndon DN, editor. Total Burn Care. 3rd ed. London: Saunders Elsevier; 2007. p. 398-419. Norbury WB, Herndon DN. Modulation of the hypermetabolic response after burn injury. In: Herndon DN, editor. Total Burn Care. 3rd ed. New York: Saunders and Elsevier; 2007. p. 420-33. Matthews DE, Marano MA, Campbell RG. Splanchnic bed utilization of leucine and phenylalanine in humans. Am J Physiol 1993;264:E109-18. Bajwa SJ, Gupta S. Controversies, principles and essentials of enteral and parenteral nutrition in critically ill-patients. J Med Nutr Nutraceuticals 2013;2:77-83. Bajwa SS, Kulshrestha A. Critical nutritional aspects in intensive care patients. J Med Nutr Nutraceuticals 2012;1:9-16. Manelli JC, Badetti C, Botti G, Golstein MM, Bernini V, Bernard D. A reference standard for plasma proteins is required for nutritional assessment of adult burn patients. Burns 1998;24:337-45. Bernstain L. Measurement of visceral protein status in assessing protein and energy malnutrition: Standard of care. Prealbumin in Nutritional Care a Consensus Group. Nutrition 1995;11:169-71. Weimann A, Bastian L, Bischoff WE, Grotz M, Hansel M, Lotz J. Influence of arginine, omega-3fatty acids and nucleotide-supplemented enteral support on systemic inflammatory response syndrome and multiple organ failure in patients after severe trauma. Nutrition 1998;14:165-72..
Deitch EA. Intestinal permeability is increased in burn patients shortly after injury. Surgery 1990;107:411-6. Herndon DN, Hart DW, Wolf SE, Chinkes DL, Wolfe RR. Reversal of catabolism by beta-blockade after severe burns. N Engl J Med 2001;345:1223-9. Bajwa SJ. The underestimated nutritional aspects of micronutrients supplementation in intensive care. J Med Nutr Nutraceuticals 2013;2:114-6. Arbabi S, Ahrns KS, Wahl WL, Hemmila MR, Wang SC, Brandt MM, et al. Beta-blocker use is associated with improved outcomes in adult burn patients. J Trauma 2004;56:265-9. Pham TN, Klein MB, Gibran NS, Arnoldo BD, Gamelli RL, Silver GM, et al. Impact of oxandrolone treatment on acute outcomes after severe burn injury. J Burn Care Res 2008;29:902-6. Wolf SE, Edelman LS, Kemalyan N, Donison L, Cross J, Underwood M, et al. Effects of oxandrolone on outcome measures in the severely burned: A multicenter prospective randomized double-blind trial. J Burn Care Res 2006;27:131-9. Yan H, Peng X, Huang Y, Zhao M, Li F, Wang P. Effects of early enteral arginine supplementation on resuscitation of severe burn patients. Burns 2007;33:179-84. Coudray-Lucas C, LeBever H, Cynober L, DeBandt JP, Carsin H. Ornithine a-ketoglutarate improves wound healing in severe burn patients: A prospective randomized double-blind trial versus isonitrogenous controls. Crit Care Med 2000;28:1772-6. Gore DC, Chinkes D, Heggers J, Herndon DN, Wolf SE, Desai M. Association of hyperglycemia with increased mortality after severe burn injury. J Trauma 2001;51:540-4. Pidcoke HF, Wanek SM, Rohleder LS, Holcomb JB, Wolf SE, Wade CE. Glucose variability is associated with high mortality after severe burn. J Trauma 2009;67:990-5. Mecott GA, Herndon DN, Kulp GA, Brooks NC, Al-Mousawi AM, Kraft R, et al. The use of exenatide in severely burned pediatric patients. Crit Care 2010;14:R153. Kudsk KA. Current aspects of mucosal immunology and its influence by nutrition. Am J Surg 2002;183:390-8. Jabbar A, Chang WK, Dryden GW, McClave SA. Gut immunology and the differential response to feeding and starvation. Nutr Clin Pract 2003;18:461-82. Kang W, Kudsk KA. Is there evidence that the gut contributes to mucosal immunity in humans? JPEN J Parenter Enteral Nutr 2007;31:246-58. Ammori BJ, Leeder PC, King RF, Barclay GR, Martin IG, Larvin M, et al. Early increase in intestinal permeability in patients with severe acute pancreatitis: Correlation with endotoxemia, organ failure, and mortality. J Gastrointest Surg 1999;3:252-62. Kudsk KA, Croce MA, Fabian TC, Minard G, Tolley EA, Poret HA, et al. Enteral versus parenteral feeding. Effects on septic morbidity after blunt and penetrating abdominal trauma. Ann Surg 1992;215:503-11. Heyland DK, Dhaliwal R, Drover JW, Gramlich L, Dodek P, Canadian Critical Care Clinical Practice Guidelines Committee. Canadian clinical practice guidelines for nutrition support in mechanically ventilated, critically ill adult patients. JPEN J Parenter Enteral Nutr 2003;27:355-73. Taylor SJ, Fettes SB, Jewkes C, Nelson RJ. Prospective, randomized, controlled trial to determine the effect of early enhanced enteral nutrition on clinical outcome in mechanically ventilated patients suffering head injury. Crit Care Med 1999;27:2525-31. Braunschweig CL, Levy P, Sheean PM, Wang X. Enteral compared with parenteral nutrition: A meta-analysis. Am J Clin Nutr 2001;74:534-42. Gramlich L, Kichian K, Pinilla J, Rodych NJ, Dhaliwal R, Heyland DK. Does enteral nutrition compared to parenteral nutrition result in better outcomes in critically ill adult patients? A systematic review of the literature. Nutrition 2004;20:843-8. Moore FA, Feliciano DV, Andrassy RJ, McArdle AH, Booth FV, Morgenstein-Wagner TB, et al. Early enteral feeding, compared with parenteral, reduces postoperative septic complications. The results of a meta-analysis. Ann Surg 1992;216:172-83. Peter JV, Moran JL, Phillips-Hughes J. A metaanalysis of treatment outcomes of early enteral versus early parenteral nutrition in hospitalized patients. Crit Care Med 2005;33:213-20. Simpson F, Doig GS. Parenteral vs. enteral nutrition in the critically ill patient: A meta-analysis of trials using the intention to treat principle. Intensive Care Med 2005;31:12-23. Marik PE, Zaloga GP. Early enteral nutrition in acutely ill patients: A systematic review. Crit Care Med 2001;29:2264-70. McClave SA, Martindale RG, Vanek VW, McCarthy M, Roberts P, Taylor B, et al. Guidelines for the provision and assessment of nutrition support therapy in the adult critically ill patient: Society of Critical Care Medicine (SCCM) and American Society for Parenteral and Enteral Nutrition (A.S.P.E.N.). JPEN J Parenter Enteral Nutr 2009;33:277-316. Mutlu GM, Mutlu EA, Factor P. Prevention and treatment of gastrointestinal complications in patients on mechanical ventilation. Am J Respir Med 2003;2:395-411. Sandström R, Drott C, Hyltander A, Arfvidsson B, Scherstén T, Wickström I, et al. The effect of postoperative intravenous feeding (TPN) on outcome following major surgery evaluated in a randomized study. Ann Surg 1993;217:185-95. Martin CM, Doig GS, Heyland DK, Morrison T, Sibbald WJ, Southwestern Ontario Critical Care Research Network. Multicentre, cluster-randomized clinical trial of algorithms for critical-care enteral and parenteral therapy (ACCEPT). CMAJ 2004;170:197-204. Choban PS, Dickerson RN. Morbid obesity and nutrition support: Is bigger different? Nutr Clin Pract 2005;20:480-7. National Collaborating Centre for Acute Care(UK). Nutrition a Support for Adults: Oral Nutrition Support, Enteral Tube Feeding and Parenteral Nutrition. London: Nation Collaborating Centre for Acute care(UK);2006 Feb. (NICE Clinical Guidelines, No.32). Available from: http://www.ncbi.nlm.nih.gov/books/NBK49269/. Bajwa SJ, Sethi E, Kaur R. Nutritional risk factors in endocrine diseases. J Med Nutr Nutraceuticals 2013;2:86-90. Bajwa SS, Kwatra IS. Nutritional needs and dietary modifications in patients on dialysis and chronic kidney disease. J Med Nutr Nutraceuticals 2013;2:46-51.